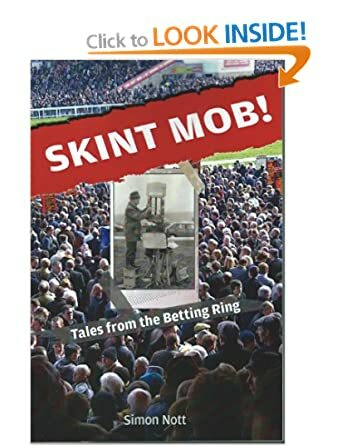 If you fancy a bit of light reading this weekend and a bit of a chuckle at the trials and tribulations of on coarse bookies then maybe Skint Mob is worth a tenner for a good few hours entertainment. Simon Nott writes a regular column in Racing Ahead with his stories from the Betting Ring. His latest was about the night of the Barney Curley betting coup and includes the story of two form students who managed to find three of the selections themselves. And how they happily showed Simon a screenshot of one of their betting accounts with a £63,000 return from their Trixies and Trebles. Skint Mob! is a 200 page king-sized paperback book with full colour photographs. It brings to life the betting rings of UK racecourses from Aintree to Ascot and Newton Abbot to Newbury via point to points and the odd nip into a betting shop. The author uses his own experiences working for bookmakers since the late 1980′s as a vehicle to bring to life the colour and characters of that most vibrant and exciting of habitats. Add a liberal sprinkling of humour and you have a must-read for all fans of UK racing and its unique atmosphere. Skint Mob only has 7 ratings at Amazon so far but has averaged a 4.5 stars and is well worth a read for any racing fan. Today we kick off a five part series of articles looking at value betting and culminating with a method for finding value bets. Take it from me, you won’t be able to turn a regular consistent profit from your betting until you fully grasp the concept of value and start applying its principles to every single bet you place. I literally cannot stress enough how important it is to understand and seek out value in all of your betting. It is, by far and away, the most important factor in profitable betting! The only way you can make profit from betting in the long term is to ensure that you are getting value prices about your bets. If not, you are doomed to failure. It is that simple. Amazingly, there are plenty of people out there who will tell you that finding winners is the only important thing. Anybody who tells you that is showing such staggering naivety (and inability to perform the simplest of calculations) that I need to meet them immediately and start offering them some wagers! The ‘Hole in One’ gang are a great example of finding a value proposition and exploiting it ruthlessly. It’s a famous story but I think it bears a re-telling here. The ‘Hole in One’ gang operated very successfully for a short time in the early 90s. They were 2 gamblers by the names of Paul Simons and John Carter who, through detailed study of past results, came to realise that the occurrence of a hole in one in professional golf, far from being a freakish, rare event was actually exceptionally common. They calculated that the true odds of a hole in one being scored in one of golf’s majors are shorter than even money. They were staggered to discover that large numbers of independent bookmakers were simply not doing their homework and were prepared to offer them ludicrous odds about a hole in one – up to 100/1 in some cases! They toured the country surreptitiously placing bets in singles, doubles, trebles and accumulators for a hole in one to be scored in the majors, taking all prices from 3/1 upwards. By the time they were finished, they had plunged their entire lives savings of around £40,000 into a multitude of bets. The rest is history. A hole in one was scored in most, if not all, of the majors that year and the gang’s winnings totalled somewhere in the region of £500,000. (Some of the bookmakers subsequently welched on the wagers and they eventually collected around £420,000). £420,000 – all for doing a very simple piece of research and realising that the odds available were offering a ludicrous level of value! Now clearly value opportunities of such magnitude (particularly on such a probable event) don’t arise everyday but you would be surprised just how often decent value opportunities do occur – particularly in horse racing where bookmakers have to assess an almost infinite set of factors in formulating their prices. Tomorrow, I will define what I mean by ‘value betting’ and work through some examples to show just how important it is. ... ..., 000, ability, accumulator, accumulators, age, anybody, Art, article, articles, Aw, bet, bets, betting, betting blogger, blog, book, bookmakers, calculation, calculations, case, cases, concept, country, decent value, decent value opportunities, double, doubles, early 90s, ears, end, entire lives savings, example, examples, exception, fact, factor, factors, failure, famous story, Fin, Fit, form, formula, Fr, freakish, gamble, gambler, gamblers, gang, GER, golf s majors, Great, great example, hand, history, hole, home, homework, horse, horse racing, Imp, important factor, important thing, inability, independent bookmakers, infinite, IRE, John Carter, kick, Kieran Ward, King, large number, large numbers, Literally, lives, Lm, long term, look, Low, ludicrous level, ludicrous odds, mag, magnitude, media, method, money, multitude, names, need, number, numbers, n’t, odds, offer, opportunities, past, past results, Paul Simons, people, piece, place, plenty, plunge, position, price, prices, principles, probable event, professional gambler, professional golf, profit, profitable betting, racing, rare event, region, regular consistent profit, research, rest, result, results, rise, RPR, score, search, selection, Selection Wolverhampton, Serie, series, set, short time, simple, simple piece, single bet, SP, staggering naivety, Stan, Star, story, study, subs, success, surprise, table, tail, term, thing, ties, time, tips, tipster, Tom, TOUR, Tp, trebles, true odds, turn, UK, upwards, value, value bet, value bets, value betting, value price, value prices, value proposition, vet, Victor Chandler, wager, wagers, war, way, way bet, WH, win, winner, winners, winnings, Wolverhampton, Won, work, www.makeyourbettingpay.co.uk, |Winners |Strike Rate, £500,000. 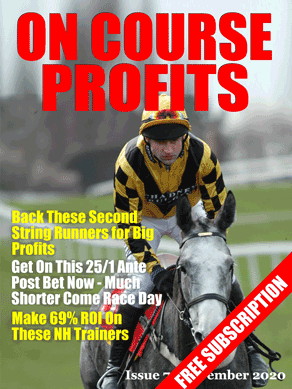 If you have been around racing for a while you will have heard of Pricewise. Pricewise is a column started long ago by Mark Coton. It is a regular column published in the Racing post and it looks to identify big priced winners. Because it tips these big priced winners two facts prevail. It has very long losing runs although makes a profit at advised prices. The prices always shorten once the column hits the streets. These facts mean that although worth betting, for most of us the losing runs mean that we can't rely on Pricewise alone for our tips. But also that if we are prepared to get up early (The digital Racing Post is out at 3.00 am!) there are trading opportunities to be had. IE if you can bet at the Pricewise advised price you can be pretty confident that you can lock in a profit later when the price shortens. As I said the original Pricewise was Mark Coton, a punting hero to many. And an author of books on value that are stil relavent today. The current and long term incumbent is Tom Segal. At the weekend I read an interview that Tom Segal gave at NTF and to say some of his answers surprised me is an understatement. How much ‘homework’ do you undertake before each selection? I think most Racing Post pundits would give the impression that they spend a lot of time on a race even if their didn't! I guess we should applaud Tom's honesty, but I can't see how you can make a comprehensive form study of a reasonable sized field in 20 minutes! Which area of your selection process do you consider to be the most important? Is he just looking for big prices on horses with a decent jockey booked? Apart from price what do you feel is the most important factor when analysing an ante-post market? Trainer I suppose but price is by far the most important. And again with the price. I know the column is all about value and the Racing Post brief is to find a contender that is much bigger than it should be. But surely you have to find one that has a chance before you look at the price. I know the column is heralded all about as a must read. And that it is a must read for many but I didn't feel inspired by those answers. If you agree with me or not I'd love to hear your opinions in the comments below.